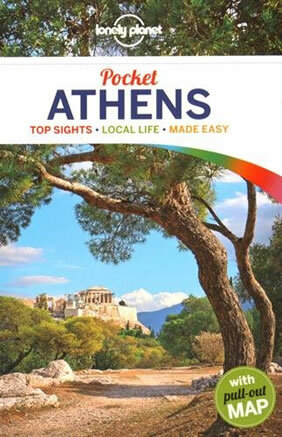 Athens, Corinth, Nafplio, Peloponnese, Sparta, Mycenae, Epidaurus, Olympia, Delphi, and more! Ancient Greece presided over an age of incomparable human achievement. Great historians like Herodotus and Thucydides, great dramatists like Sophocles, Euripides and Aeschylus, and the brilliant philosopher Socrates still shine like beacons of light in today’s search for knowledge and understanding of our world. Democracy was embraced as an experiment that would set the foundation for governments to come. Amazing structures were built in Athens and other Hellenic city-states, many of which still stand to remind us of the genius and creativity of the early Greeks. It was an age of human discovery and achievement – an age which proudly bears the name classical. 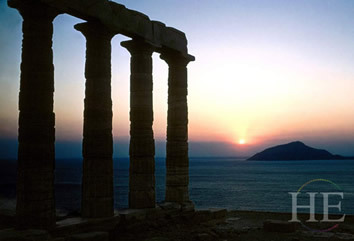 For almost two weeks we will experience the Golden Age of Greek Civilization first hand. Starting in Athens, we’ll visit the Parthenon, the iconic structure overlooking the city from the Acropolis, we’ll dine in traditional tavernas, and stroll through the lovely Plaka. From there our journey takes us west to historic Peloponnese sites such as Corinth, Mycenae, Epidaurus and Olympia. Our home base to start our exploration will be Nafplio, a charming city perfectly situated on a promontory overlooking the Argolic Gulf. We will pause in our journey in a coastal town on the Mani Peninsula, where we can enjoy outdoor activities, or take a swim (weather permitting). Then after a night in Olympia we head to Delphi, arguably one of the most stunning of all the temples extant in mainland Greece, staying in the hillside village of Arachova. 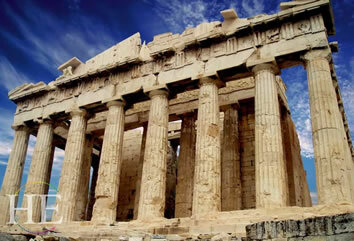 • See the Parthenon, a paradigm of classic Greek architecture, which crowns the Acropolis in the heart of Athens. 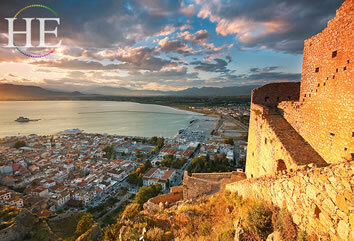 • Enjoy a seaside stroll in Nafplio, a lovely port in the Peloponnese. 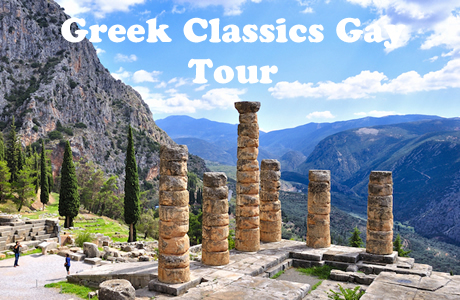 • Tour the sites of the ancient cities of Mycenae and Epidaurus. • Gaze at the Corinth Canal, one of the oldest man-made waterways in the world. • Visit Olympia, birthplace of the Olympic Games. 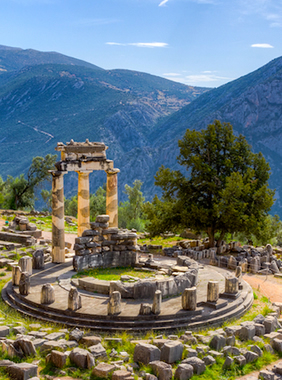 • Walk in Apollo’s footsteps at the famous Temple of the Oracle at Delphi. • Savor the variety of flavors of Greek cuisine and wines during several special meals. Get ready to step back in history to the Golden Age of Greek Culture and Civilization. 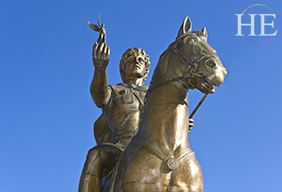 For the next several days we will walk in the footsteps of great figures from history and mythology. 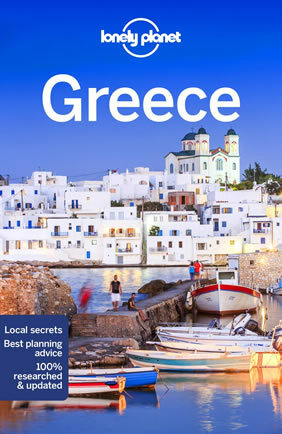 We will climb up to the Parthenon, stroll through Olympia, search for the oracle of Delphi and enjoy a first-class gay travel Greece holiday. It’s not all history and ruins though. There will be plenty of delicious meals in traditional tavernas, seaside photo ops, and a chance to enjoy stunning Greek sunsets. Upon arrival at Athens Airport we will be transferred to our spacious hotel located near the Plaka. The Plaka is the oldest part of the city and distinguished by its narrow streets, winding lanes and authentic churches, shops and restaurants. You may want to take a stroll to shake off the jet lag and check out the colorful shops and vendors. 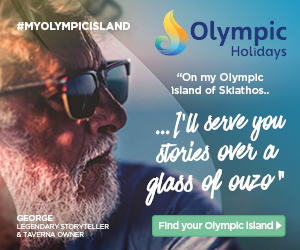 We’ll dine together at a restaurant situated at the foot of the Acropolis, toasting the beginning of our journey with the famous Greek ouzo or perhaps another Greek favorite, homemade lemonade. This morning, we meet our archaeologist guide and set off for an exploration of the ancient city. 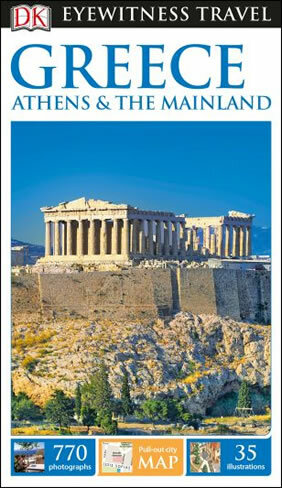 We start with Athens’ great Acropolis, crowned by the Parthenon, the great temple of the virgin goddess Athena. Afterward, we continue with a visit to the National Archaeological Museum. Return to the hotel for an afternoon at leisure during which you can explore the ancient Agora or wander around the busy narrow lanes of Plaka. Later, we’ll meet in the lobby and walk to a local restaurant for a Greek nouvelle cuisine experience. This morning we’ll leave Athens, crossing the ancient man-made Corinth Canal, to the Peloponnese region. Our first stop will be the archaeological site of Corinth. Ancient Corinth was one of the largest and most important cities of Greece, with a population of 90,000 in 400 BC. The Romans demolished Corinth in 146 BC, then built a new city that became the provincial capital of Greece. For Christians, Corinth is well-known from the two letters of Saint Paul in the New Testament, First Corinthians and Second Corinthians. Corinth was renowned for its temple of Aphrodite, the goddess of love, which employed some thousand hetairas (temple prostitutes who served the wealthy merchants and powerful visiting officials). After the visit of Corinth, we will continue our journey to Nafplio, a lovely seaside town dominated by its massive medieval citadel, first capital of Independent Greece from 1821 to 1834, where we spend the next two nights. Afternoon at leisure. In the evening meet in the lobby and walk to dinner. We continue to visit the fascinating sights in the area: Epidaurus, with the best preserved ancient Greek theater, and the mysterious ruins of Mycenae, center of the world of the Iliad. We will be back at our hotel in Nafplio in the early afternoon. Enjoy your evening at leisure. This morning after breakfast depart for the southern part of the Peloponnese. Our first stop will be in Sparta. The city rose to become the dominant military land-power in ancient Greece. Given its military pre-eminence, Sparta was recognized as the overall leader of the combined Greek forces during the Greco-Persian Wars. Between 431 and 404 BC, Sparta was the principal enemy of Athens during the Peloponnesian War, from which it emerged victorious, though at a great cost of lives lost. Sparta’s defeat by Thebes in the Battle of Leuctra in 371 BC ended Sparta’s prominent role in Greece. However, it maintained its political independence until the Roman conquest of Greece in 146 BC. 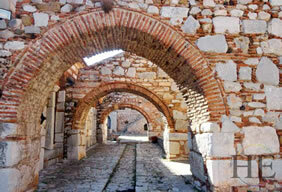 It then underwent a long period of decline, especially in the Middle Ages, when many Spartans moved to live in Mystras. Modern Sparta is the capital of the Greek regional unit of Laconia and a center for the processing of goods such as citrus and olives. We shall stop for a light lunch then continue our journey to the southern-most part of the Peloponnese, ultimately to stay in one of the villages of the Mani Peninsula. Today we will take a leisurely drive through the villages of this picturesque part of Greece, including Aeropoli, Gerolimenas, Vathi, and Githeyo. This morning we take a visit to Olympia, the birthplace of the famous games. Carved into the side of a wooded slope with olive trees covering the surrounding landscape, there is magic in the air as you step onto the track where the Games were first held. Every Olympic year (Winter and Summer alternately) the Olympic torch is lit at this very site. Legend says Hercules initiated gymnastic and athletic training and events in this area near the shrines of Pela, Hera, and Zeus. Today the town of Olympia remains a destination for pilgrims who wish to see the sacred sites and the hallowed ground of past athletic achievement. Our three-hour drive from Olympia to Delphi will begin as we cross the Gulf of Corinth from the Peloponnese back to mainland Greece. We will cross the Rion-Antirion Bridge, the world’s second longest cable-stayed bridge, a remarkable example of technology and a very impressive sight. Our destination is Delphi but we will be staying nearby in Arachova, a lovely village with services and accommodations not found in Delphi. 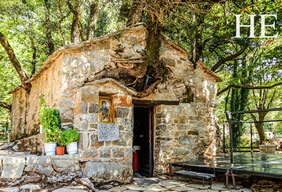 Arachova is a traditional village perched on Mount Parnassus, with homes made out of stone, nice restaurants, bars and shops. It is a perfect place for a relaxing stroll or to stop and contemplate the history of the region. It is sometimes called the Mykonos of the winter, as nearby ski resorts attract many regional visitors. Today we tour the ancient sites of Delphi, the most important religious center of its time. Often considered the center of the world, Delphi was Apollo’s dwelling place and home to the famous Oracle of Delphi. Situated on Mount Parnassus and overlooking the River Piesto with the Bay of Corinth in the distance, the views from Delphi are breathtaking. We’ll follow the Sacred Walk up to the Temple, passing the Treasuries, the polygonal wall and several other buildings. Finally, we will reach the Temple of Apollo, dating from the 4th Century BC. This classic structure holds a commanding view over the sprawling agora and surrounding area. Within the confines of the Temple we will pay our respects to the Oracles of Delphi. The oracles were given a small chamber where a magical spring flowed and sent the oracles into a trance. We will pause for a moment to see if we will be touched by the ancient wisdom-giving spring. We’ll visit the theater of Delphi, just above the Temple of Apollo, and one of the best preserved in Greece. With 35 rows of seats, it could accommodate 5,000 people. Finally, no visit to Delphi would be complete without a tour of the museum. The museum houses many of the artifacts saved from the ruins. It also houses arguably one of the most famous and beautiful statues of early Greece, The Charioteer. This wonderfully preserved bronze statue from 478 BC is a remarkable example of the achievements of the Greek sculptors of their day. Dinner tonight will be on your own at one of the many fine choices in Arachova. Today we’ll return to Athens for our final day of touring. We’ll enjoy our farewell dinner together tonight. Our Greek holiday is complete. Transfers to the Athens Airport will be provided for those departing on this day. For those with more time, we urge you to stay for the optional Extension to Mykonos. The island of Mykonos is surrounded by the warm waters of the Aegean Sea. 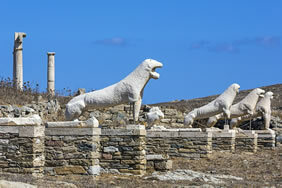 Nearly 2500 years ago, Mykonos and the neighboring island of Delos thrived as the commercial heart of the entire region. 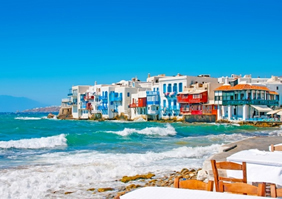 Today, things are much quieter, but Mykonos has one of the popular summer and fall destinations for European gay travelers. The main village straddles a bluff above the sea, with one narrow lane winding through the village – and shared by pedestrians and donkey carts. Mykonos is also known for its broad sandy beaches, accessible by short bus rides from the main town. Join us for a 3-night, 4-day exploration of this beautiful island! This tour starts and ends in Athens, Greece, with the Mykonos Extension ending on Mykonos. This trip includes walking on uneven paths among the ruins including going up and down hills. Anyone who can comfortably navigate through historic sites and walk on city streets, dirt paths and sandy beaches will enjoy this trip.